Just in time for the Olympics, this post is. Or it will be if I backdate it. Several years ago, it was asserted that scenic Albany, New York, and not scenic St. Moritz, Switzerland, was the original home of the bobsleigh. Writing on the debate back in 2002, the Times Union’s Tim Farkas said a report from Albany City Historian Virginia Bowers listed the year of origin as 1885. This test would make it clear it was on the minds of Albanians at least three years earlier than that. The story goes that the earliest bob sleds were adapted from their use as lumber sleds, where two short (“bobbed”) sleds were linked together and hitched to teams of horses that could carry enormous loads of lumber. “. . . American boys and young men are rapidly pushing the bob sled to the front as an American institution. Last month the Common Council of Albany, the city of hills as well as the capital of the Empire State, passed an ordinance making it lawful to use, every evening after half past seven, certain streets within the town limits for bobbing or coasting. Therefore doth the heart of the young Albanian rejoice to know that now, instead of running the risk of being arrested for indulging in his favorite pastime, the once-dreaded police are detailed to clear the track for him. The deepest snow of the season lay on the ground the week this marvellous change was wrought, and every night the favored streets echoed to the shouts of the happy ‘bobbers’ and to the clanging of their gongs of warning. condition, and the town will be wild over bob sliding before next week. sled in the centre at intervals of 100 feet. nearly three tons weight. Several bobs in line were over 30 feet long. 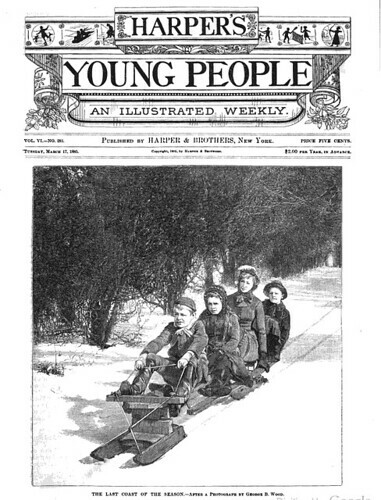 While I’m doubtful that the early settlers indulged in bobsledding (after all, their free time was taken up selling sugar cookies to the Indians), these accounts of the long-forgotten bobsledding craze of the 1880s really make me wish we could still go sledding down Madison Avenue, banging gongs, frightening (and occasionally killing) horses and passersby and generally having a grand time. There was even a landmark legal case, Toomey v. The City of Albany, 1898. Toomey’s horse and sleigh, standing on a public street, were struck and damaged by a bobsleigh engaged in coasting down the street. Toomey claimed that the accident was due to the city’s negligence in allowing the street to be used for coasting. The court found that “prevention of fast driving and the like is a part of the police business of the city. And a negligent performance of that business or duty is not a ground for action against the city.” I think the law has changed since then, but it’s still a not a good idea to tie up your horse on a bobsled run, and that’s why you rarely see horses at modern winter Olympics. A modern revival of the Winter Carnival would be a wonderful idea, except today we can’t be sure whether the chosen weekend will be below zero and coated in an inch-thick layer of ice, or 75 degrees. Sadly true. Even in the ’80s, Syracuse had a hard time timing winter carnivals, and always seemed to hit the February thaw.